Boards of Intermediate & Secondary Education (BISE) have announced the results of Annual Intermediate Examinations 2018 on September 11th. In a ceremony held on September 12th, top position holders were honored for their academic achievements. Intermediate examinations are a defining moment in a student’s life. The score achieved in the exams plays a major role in determining the prospects for further studies that later define the future career of these students. Board examinations in Pakistan are termed as the toughest and nerve-racking experience for a student. In Punjab, there are nine boards operating that offer an array of subjects spanning across pre-medical, pre-engineering, general science, arts (F.A. ), computer science (I.CS), and commerce (I.COM). Each year, thousands of students from public and private colleges appear in Intermediate Examinations. The passing percentage of all the nine boards stand at 59.87%. Punjab Colleges secured a whopping number of 153 top positions. Other colleges that made a mark on the position board include, GCU, KIPS, Superior College, Kinnaird College and students who appeared privately for the examinations. In All Board Intermediate Results, Punjab College Lahore Kashaf Sanaullah student scored 1062/1100 marks securing overall 1st position. In Multan Board, Punjab College Multan student Samreen Shahid scored 1052/1100 marks securing overall 1st position. 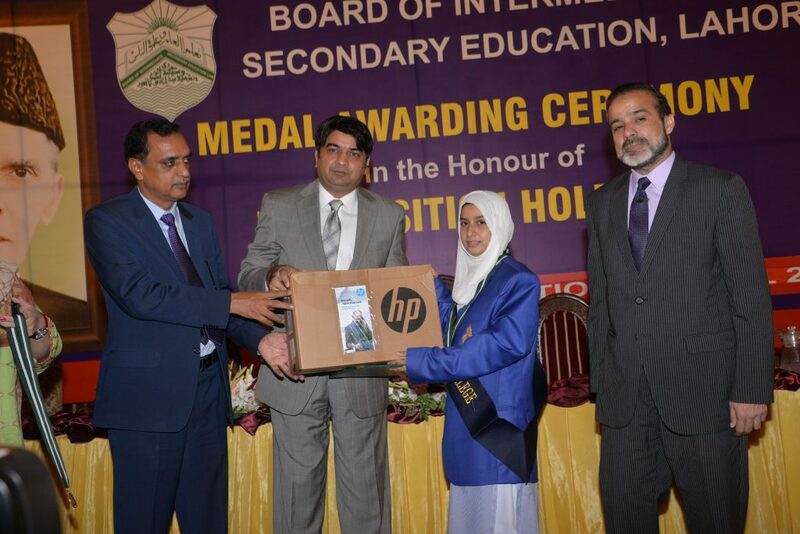 In Gujranwala Board, Punjab College Sialkot student Maliha Maryam scored 1051/1100 marks securing overall 1st position. In Faisalabad Board, Punjab College Faisalabad student Mehwish Saleem 1051/1100 marks securing overall 1st position. In DG Khan Board, Punjab College Kot Addu student Faryal Pervez 1057/1100 marks securing overall 1st position. In Rawalpindi Board, Punjab College Chakwal student Zaheka Tul Jannat 1048/1100 marks securing overall 1st position. In Federal Board, three students from Punjab College Sarghoda, Hammad Saleem, Masooma Zainab, and Momina Maham scored 1058/1100 each to share overall 1st positions. Punjab College secured three overall positions and 21 top positions. Kinnaird College and KIPS secured one position each. Govt. Degree College Bahawalnagar clinched overall 1st position. Punjab College secured 10 top positions. Superior College achieved two positions. Govt. PG Layyah notched three positions. Govt. College Women Muzzafargarh achieved three positions. Punjab College students commendably notched 1st Overall position (shared by 3 PGC students), the 2nd Overall position and 12 top positions. Punjab College bagged 3 overall positions while clinching 19 top positions as well. KIPS College scored six positions. Superior College secured two positions. ILM College achieved an overall 1st position and four positions in total. DPS College Khushab nailed overall 2nd position. Punjab College stood out by accomplishing 10 top positions. Superior College notched 3 positions. Punjab College clinched overall 1st & 3rd positions with 11 top positions collectively. KIPS College secured four positions. Nishat College scored two positions. Burten College achieved two positions. According to this breakdown, Punjab Colleges have dominated the results with 153 positions, mostly in science subjects. Government colleges such as GCU and Kinnaird College secured seven and one positions respectively. Moreover, eight positions were secured by students who appeared privately in All Boards Intermediate Exams. Securing these positions with such flying colors is no small feat for Punjab College students. This achievement will contribute to a healthy competition in academics and hone young brains to prove the acumen of Pakistani intellect. This story has been produced in collaboration with the sponsor and does not necessarily reflect the views of TechJuice editorial staff.